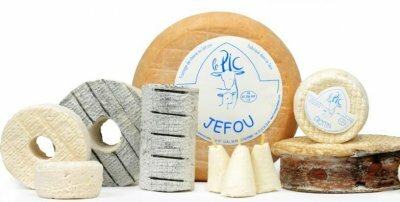 Contrary to what its name might suggest (literally “the peak”) ; the goat cheeses from the Fromagerie du Pic are made on a plain. After having bred goats for several years, the Rémond family is now devoted to the production of a wide and innovative range. The softness of the products, their original shapes and the variety of manufacturing technologies are all incentives to yield to the pleasure of a tasting. You will for sure melt for this range which combines simplicity and a touch of craziness ! Rouelle, Pechegos, Tomme du Pic, Cabecou… in wooden cases for the cut department, or in self-service boards.